Udaipur. Learn to lose in life, learn to play, learn to follow discipline in life with determination, then adjusting with all these and moving towards your goal, then your children will be automatically created. Among these things, a special message was also given to the parents that if you focus on the child's interest, do not impose your own wishes on any one's children, then the career of the children will be well made. If the parents impose their own wishes on children, the child's career spots your desires will become a hindrance in the child's career. For the guidance of promising students preparing for the above ideas IAS, RAS, Engineering, Medical, MBA, Banking Sector,, Chartered Accountant etc, Career Guidance from Chittodara Jain Vikas Sansthan has emerged in the Motivational Seminar Career Convention. This seminar was organized on Sunday at the Sukhadia Rang Manch located on Town Hall. Experts gave detailed lectures on children's methods of preparing exams and various dimensions. In the beginning of the ceremony, Prof. SL. 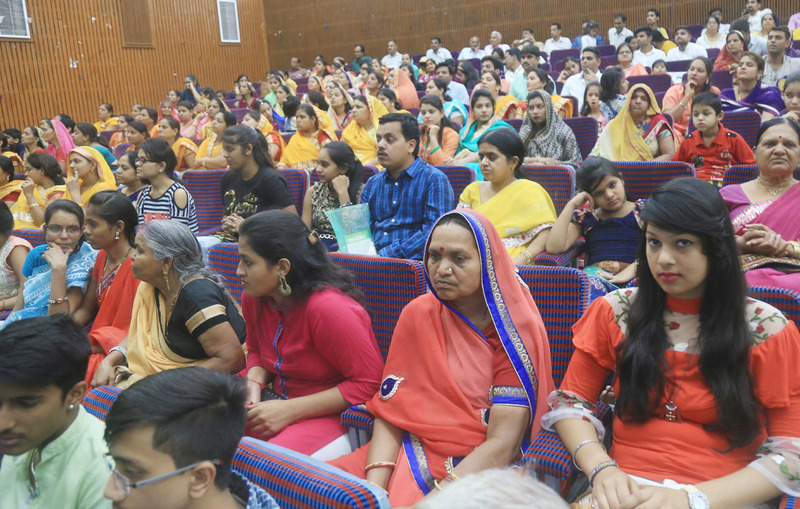 Jain and Pradeep Selawat, while giving a welcome, highlighted the purpose and significance of the seminar, said that with today's modern ted lifestyle, children must be aware of modern education system too. Director TAD, Sudhir Dave told about the various schemes being run for the minorities by the state government, due to lack of information they are not getting advantages of them, Despite the talent, because of economic difficulties The children go backward and their career gets ruined. He gave information about various government schemes and loans to the students, youth and women, and loans given at the general interest rate for education and self-employment. Pro. Deepak Sharma said that students should have mainly three qualities: first goal, second interest and third skill development. If these three qualities are, then according to the circumstances children's career becomes self-made. Children should set goals where they are interested and have the ability to work. Never take care of other students without taking any interest in the subject and work, because it gets worse rather than a career, and afterward nothing is achieved except in remorse. Director Ascent coaching Manoj Bisarati said that students should always maintain a passion within themselves. Director Sarathi Classes MS Bhati said that he has been most impressed with Jain philosophy in his career. Jain philosophy always inspires to move forward. Director, Aravali Hospital, Dr. Anand Gupta said that today every child with the parents also has the same desire that they become an engineer, a scientist, a doctor, or a CA, but there will be few who would want him to become a dancer, singer a hero, make it or go to any other areas. A career should be made not only in the selected areas but also in the interest in which you are fluent. First of all, the body needs to be healthy. If the body is healthy then the brain will be healthy. It is important for all of them that whatever bad habits you have in your life should be left immediately and you have to make a list of whatever things are done to make you wander away and see them every day and have to remove them from your life. Director MDS Group of Schools Dr. Shailendra Somani discussed in detail about how to reconcile parents and children in order to understand each other's feelings. They told the children that whenever you get a chance, do not wait any longer. District collector Bishnu chran Malik said that the parents of the children are the original Guru. Parents know them well and can help them well. But parents should never ever give their consent to the wrong decision of the children and neither should they impose their own wishes on the good decisions of the children. Speaking on certain financial aspects of life, the District Superintendent of Police Rajendra Prasad Goyal said that after 10th, the children should not be too ambitious. Never give much emphasis on career. It should always be thought that what you are doing is right but there must be an understanding that your decision is right. Neurologist. Arvind Sharma &Vineet Baya said that do not be afraid of defeat, play well and eat plenty and read on time when the time has come. The biggest thing is to keep in mind that never let quirky people calm down in life. In the end, the director of the Acme Group, Amit Jain said, "I have to do this, but why do I have to understand these two things, nobody can stop your career success." The website of the institution was also released by the guests in the program. A vote of thanks was delivered by Nathulal Vidalia, The program was conducted by Asha Jain.